Exclusive: Check out this Zero Cost Marketing Secrets webinar replay for discounts and more information about this course. Replay will be available until October 2, 12midnight, PST. 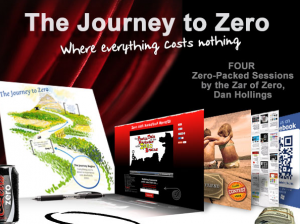 Zero Cost Marketing Secrets is the newest training program by Dan Hollings and another product of his partnership with the Rapid Crush Software Club. This training program is exactly what it sounds like – discovering and learning to use marketing secrets that won’t cost you a dime. Zero Cost Marketing Secrets does sound somewhat promising, and given the fact that it will be taught by Dan Hollings himself you can expect an information packed course. But like every training program, Zero Cost Marketing Secrets comes with a fee. Most of you will be thinking how ironic this whole idea is. Right? A paid course to know all the free tools for marketing? Is it worth it? Find out more about Zero Cost Marketing Secrets in this review. In 2006, Dan Hollings spearheaded the internet and marketing strategy for the highly successful book and movie “The Secret” by Rhonda Byrnes. A lot of people know that. But not a lot of people know that Dan Hollings was able to catapult The Secret to success without spending a dime with all the marketing and internet promotion! Aside from that, he is also one of the foremost internet marketers who recognized the potential in mobile marketing. In fact, he had a collaboration with Wilson Mattos for a mobile marketing course called Step by Step Mobile. Set to launch on March 12, 2012, Zero Cost Marketing Secrets or ZCMS will be composed of four live webinars, each one about two hours long, where Dan will show how to integrate the free tools he will share into your existing campaigns and the best strategies for implementation. Dan has publicly shared these tools because he said that the Zero Cost Marketing Secrets course is about implementing strategies and optimizing these zero cost tools. More importantly, the course will teach you how to put all these tools together to get the best results. As mentioned earlier, the course is to help online businesses owners spend less on marketing tools. More specifically, Dan identified 25 business areas where Zero Cost Marketing Secrets will come in handy. Here’s the bitter pill, Zero Cost Marketing Secrets is not cheap. The initial investment will be at $534.52 but there is a 30-day money back guarantee. Aside from the attending the live webinars, all sessions will be recorded for you. Needless to say, it has the potential to be an evergreen product that you can use for your own businesses. What Can You Achieve With ZCMS? The main premise of Zero Cost Marketing Secrets is to help you minimize costs in your online business. Aside from that and learning how to utilize the free tools mentioned above, what else will you be able to achieve with ZCMS? It is not everyday that a guy who runs million-dollar campaigns will teach you how to do the same by using free tools. Zero Cost Marketing Secrets is a unique course that is worth checking out.